The Martin Building is located on the south side of Route 6 next to the Wysox Animal Clinic, two doors from Arey Lumber and across the street from Arrow Glass, approximately 1/4 mile from the light at the intersection of Route 187 & Route 6, and approximately 1 1/2 miles from the bridge crossing the Susquehanna River in Towanda. Coming from the east; Rummerfield, Standing Stone:Traveling west on Route 6, upon entering Wysox at the light at Route 187 continue for approximately 1/4 mile. The Martin Building will be on your left hand side directly across from Arrow Glass. Coming from the west; Athens, Troy, Burlington, Towanda:Traveling east on Route 6, upon crossing the bridge in Towanda, continue about 1 1/2 miles, past the light by the Tops Super Market, the Comfort Inn and Sears. The Martin Building is two doors away from Arey Lumber and adjacent to the Wysox Animal Clinic on your right. Coming from the north; Rome, Nichols:Travel south on Route 187 to the Route 6 intersection. Make a right on Route 6 (west), and drive approximately 1/4 mile. The Martin Building will be on your left hand side directly across from Arrow Glass. Coming from the south; New Albany, Dushore:Take Route 220 North to Towanda. After crossing the Susquehanna River bridge, continue about 1 1/2 miles, past the light by the Tops Super Market, the Comfort Inn and Sears. 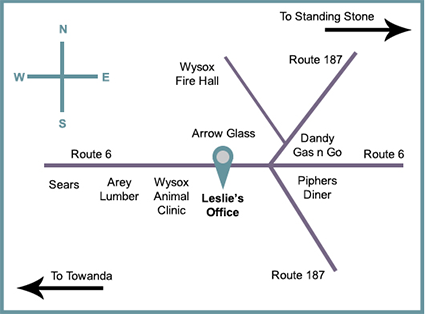 The Martin Building is two doors away from Arey Lumber and adjacent to the Wysox Animal Clinic on your right.